These values may differ with what you see in-game or written elsewhere. But that is what the manual says. 1 Must be crafted from a Blueprint at a City Terminal or Tek Replicator. 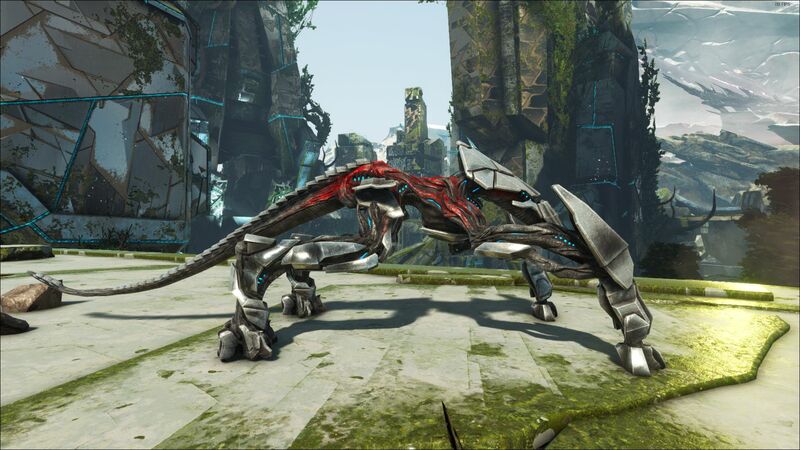 The Enforcer is one of the Creatures in ARK: Survival Evolved. 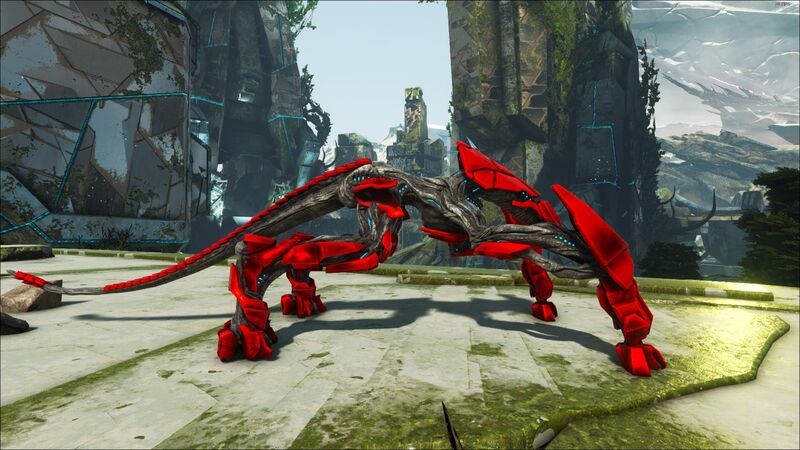 This creature was added in the DLC Extinction. This dossier section is intended to be an exact copy of what the survivor Santiago, the author of the Manuals has written. There may be some discrepancies between this text and the in-game creatures. With its speed and teleportation capabilities, Autonomous Ground Vehicle MQ-9X is built to close gaps quickly and engage its targets in close quarters. Once in range, it uses refined Element claws with lethal force. MQ-9X was clearly designed for urban combat. Its claws and shock absorbers let it scale walls and drop down to street level from significant heights, and we've only seen it patrolling within the city limits. Possibly the remnant of an automated police force or defensive army. Every MQ-9X I've encountered is stuck on a defensive loop, and overriding its primary directive is impossible. However, if we're able to acquire an intact processing core from a hostile unit, with enough parts I could reverse engineer our own, more loyal model. Could be useful - the grooves on its back are suited for a rider, so we wouldn't even need to build saddles. Enforcers will generally wander around the Sanctuary passively, and will not typically attack a survivor or their creatures. If a survivor or creature chooses to attack an Enforcer, however, they will retaliate. Enforcers may attack the survivor if one of their Scouts spots the survivor attacking/killing another creature. 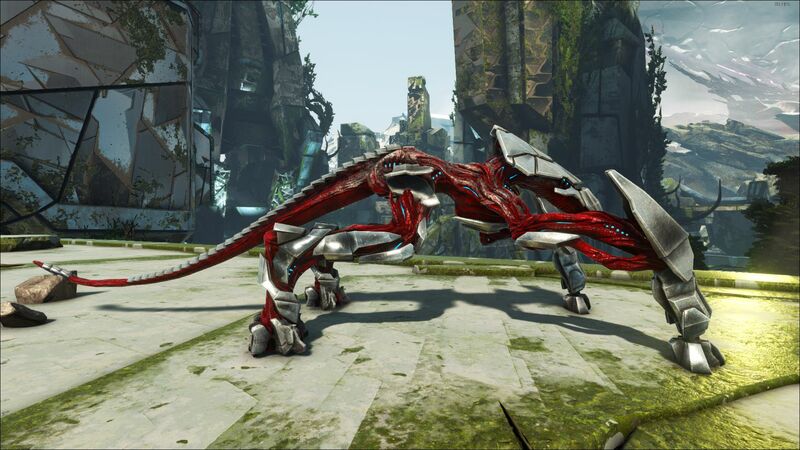 This includes taming a creature, so be careful when attempting to tame a dinosaur near an Enforcer. Although at times this is unpredictable, an Enforcer will generally attack carnivores on sight. They are not inclined to attack tamed creatures normally, but have been reported to do so. Always make sure you have an eye on a nearby Scout, as it will alert an Enforcer on any aggressive behavior. They will also attack Defense Units who display sporadic aggressive behavior. The Scouts can mark aggressive targets when they spot one (survivors and tames included), after which, Enforcers will locate and attack said target. Carrying a weapon can aggro an Enforcer if a Scout targets a survivor. Enforcers look a lot like thin robotic lizards with a featureless head and an implant in the middle of the face. Their limbs are armored like a robot’s. They have a red ring around them when they are aggravated. This red ring indicates that they are in pursuit of a dinosaur or survivor. 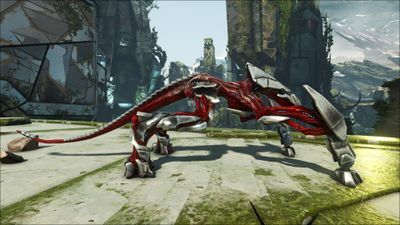 This creatures appearance doesn’t apply to Xbox which has every region be the body. This section displays the Enforcer's natural colors and regions. 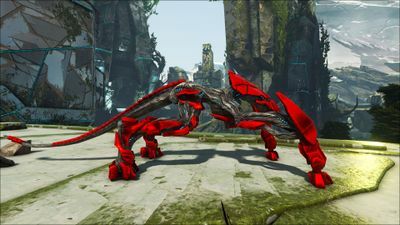 For demonstration, the regions below are colored red over an albino Enforcer. The colored squares shown underneath each region's description are the colors that the Enforcer will randomly spawn with to provide an overall range of its natural color scheme. Hover your cursor over a color to display its name and ID. For example, "cheat SetTargetDinoColor 0 6" would color the Enforcer's "body" magenta. This section describes how to fight against the Enforcer. The Enforcer can teleport over short distances as seen in the Extinction trailer. Their build allows them to walk sideways as well, allowing them to easily flank anything they target. They are also capable of climbing walls; to do so, press and hold space when you are near a wall to grapple onto it. Any dino as basic as a Triceratops can defeat an Enforcer due to their low health. If you are not riding a dino a Shotgun, Assault Rifle or Crossbow is recommended (depending on what stage of the game you are at) as Enforcers are fairly similar to Raptors in terms of stats. However, keep in mind that weapons like the crossbow have a slow reload time and are more powerful at a distance. The Enforcer will be able to teleport to you and attack you after you have only fired one crossbow shot. Keep a Pike handy in case this happens, as it can make quick work of low level enforcers assuming you have a reliable set of armor(Chitin and above is recommended). You should not let the Enforcer corner you, as its attacks are very fast, and deal a lot of knockback. You can use the knockback to keep your distance. Use a shotgun, assault rifle, pike (depending on your stats and armor), or a crossbow to fight them. Enforcers are quick and have an AOE knockback attack that can slow you down. Their speed in tandem with their respectable attack can make them severe threats to survivors on foot. Normally Enforcers are passive to players unless attacked first. However if you are marked by a Scout that notices you in combat with other creatures, Enforcers will become hostile. Pay attention to your surroundings and make sure you're not being marked by a Scout if you see an Enforcer, if you're wanting to avoid conflict. Enforcers are susceptible to Bolas, making for an easy kill. Their low healthpool gives players a great advantage over them, as they can be quickly killed. To be able to craft anything better than a level 1, a roaming Enforcer must be killed. On death, it leaves behind a blueprint in a dropped package where it died. Enforcers consume Element Dust as its "food" source, although for the Enforcer the food bar is replaced with an "Energy" bar. Pack Mule - Enforcers leveled to high weight percentage can carry loads of material on their end. Moreover, they warp over to the following survivor if they can't reach. City Traverser - Enforcers with high stamina can traverse around the city with more ease than nearly any creature by virtue of their speed, wall-climbing, and teleportation. They don't take fall damage either. If you level up weight as well, they can be useful to harvest Element Dust, Crystal, Electronics, and Scrap Metal from metal remains (Lamposts and benches). If the energy bar of a tamed Enforcer is empty, it will "starve" to death, like all other creatures. The Enforcer doesn't receive falling damage. If you leave the game while the enforcer is climbing at the next start it will be unable to attack. To solve the problem you have to close the game while the enforcer is on the ground. Enforcers do not swim or float while being ridden, when underwater in these circumstances, they will move on the floor of the body of water as if on land, much like the Rock Elemental. Curiously, the Enforcer can be scared by a Yutyrannus, despite being a machine. As of v287.103, the Enforcer cant be healed using Meat even though it does not increase the Energy of the Enforcer. Enforcers are capable of moving while immobilized by Bolas by teleporting. Use a Bola from behind the Enforcer to avoid the knock-back attack and teleport. Although you can name them like any other creature, tamed Enforcers at first are given random names that consist of letters, numbers and dashes, almost like a serial number. In patch v287.110, Enforcers were supposed to get 60% damage reduction against corrupted creatures. However this change was never implemented despite being in the patch notes. Whether or not it's a "bug" or misleading intention is not known. The Enforcer as seen in the initial trailer for Extinction. 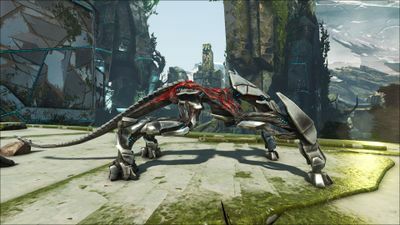 The Enforcer as seen in the launch trailer for Extinction.